The dissemination activities within the ARGOS project are being carried out with a high intensity as the project is getting closer to its final point. The Charles University in Prague is also participating in dissemination of the project outcomes, partly through its own conferences and workshops, partly through guest presentations at externaly organized events. The latter was the case on October 8-9, 2015, when Libor Stejskal from Center for Security Policy, Charles University in Prague, took advantage of being invited to the annual meeting of the Energy Infrastructure Security Network (EISN), which was to take place in Budapest, Hungary. The EISN is a private-public network that has been formed for sharing experiences and for taking part in the latest developments regarding critical infrastructure (CI) protection, namely the CI for energy supply - electricity, oil, and gas. The members of the network contribute to deliver a professional non-binding exchange of information on the security of energy infrastructure. Experience and best practice are compared and discussed with the focus on what can be done to enhance security. The network is the natural source for updated information on directives, conferences and standardisation activities. The network is a strategic information sharing platform to provide members with the relevant tools to protect the European infrastructure. The EISN management is performed by the Programme Committee and Secretariat, which is embedded in SIS - the Swedish Standards Institute. The meeting in October 2015 was hosted by MAVIR, Hungary's Transmission System (or Grid) Operator. 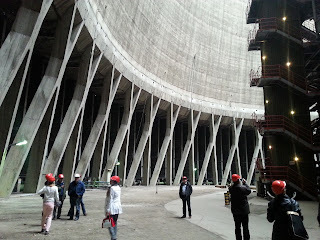 The first, and most attractive phase of the meeting was arranged as a field trip to Mátrai Erőmű, the second largest Power Plant in Hungary, located some 90 km from Budapest to North-East-East. Here all the participants received basic information on this Lignite coal Thermal Power Station, and then they took a ride through the area of the Power Plant, the subsequent production facilites for treatment of waste ashes (Ytong, Baumit, and other construction material producers), and last, we could oversee the nearby Visonta Strip Mine where most of the Lignite for burning is being excavated. The ride through the facilities showed obviously that the security of perimeter is not perceived as a priority here at all, as most of the fences around the Power Station were in a surprisingly poor condition, with just fragments of CCTV, focused on main entrance only. In the afternoon part, Libor Stejskal took a plesure to give a short briefing, entitled "Innovative approaches to physical security of critical infrastructure: presentation of the ARGOS project". I introduced its premises, key components, functionality, and casted the video. The audience of some 23 experts from electricity production companies, transmission system operators, and emergency management agencies were very attentive and responsive, and so we spent some time with a discussion on the nature and desired capabilities of the system. The evening and the day two of the meeting were dedicated to Hungarian approach to cyber security and to IT and cyber threats to energy industry and energy critical infrastructure. The weakest point of the EISN meeting was a really bad weather for both days. Nevertheless, the presentation of ARGOS project succeeded in the principal objective of dissemination: it addressed a completely new range of actors, both large companies of the European energy industry, and individual experts who deal with energy CI facilities protection. The participants came from Germany, Sweden, Austria, Czech Republic, Netherlands, United Kingdom, Slovakia, and, of course, Hungary.